Washington (CNN) – As Hillary Clinton made waves for her remarks about Russian incursions into Ukraine, a Republican super PAC sought to tie the former secretary of state to the Obama administration's handling of the unfolding crisis. A 30-second web video by America Rising PAC stitches together public statements by then-Secretary of State Clinton and President Barack Obama on their attempted reset of U.S. relations with Russia. The video includes a 2009 meeting when Clinton famously presented Russian Foreign Minister Sergei Lavrov with a red "reset" button to signify the start of closer ties between the two superpowers. The clips are juxtaposed with recent news reports about Russian forces moving into Crimea following a popular uprising that overthrew Ukraine's president. The strife in Ukraine is only the latest thorn to develop in the U.S.-Russian relationship. The Obama administration was upset when Russia last year granted asylum to NSA leaker Edward Snowden. 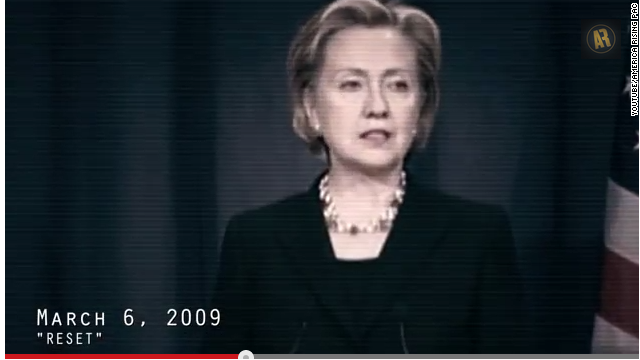 Clinton served as secretary of state under Obama from 2009 through early last year. The video release follows remarks Clinton reportedly made Tuesday comparing Russian President Vladimir Putin's rhetoric on Ukraine to Adolf Hitler's justifications for Nazi Germany's annexing of neighboring Austria and Czechoslovakia's Sudetenland in 1938, just prior to the start of World War II. According to a reporter for the Long Beach Press-Telegram who attended the closed Boys & Girls Club of Long Beach fundraiser, Clinton said Putin's rush to protect anyone of Russian descent in Crimea is reminiscent of the way Hitler sought to unite ethnic Germans before the Second World War. "Now if this sounds familiar, it's what Hitler did back in the 30s," Clinton said, according to the report. "All the Germans that were ... the ethnic Germans, the Germans by ancestry who were in places like Czechoslovakia and Romania and other places, Hitler kept saying they're not being treated right. I must go and protect my people and that's what's gotten everybody so nervous." America Rising PAC Executive Director Tim Miller said criticizing Clinton over the situation in Ukraine was fair game. "Secretary Clinton was the face of the failed Russia 'reset' policy, the naïveté of which is now plain for the world to see," Miller said. "Her clumsy attempt to try to overcompensate for this failure by comparing Putin to Hitler only further illustrates just how misguided the reset policy was and what a weak political position she's in." Adrienne Elrod, vice president of communications for Correct the Record, said Clinton had repeatedly voiced concerns about Putin during her tenure at the State Department. “Her concerns about Putin are consistent, calling him untrustworthy in 2008 and expressing concerns again in 2012 that Putin was attempting to re-Sovietize Eastern Europe,” Elrod said. Proponents say the "reset" with Russia did yield some benefits for the US. Russia did not move to block a United Nations vote on military airstrikes in Libya in 2011. The country also worked with the U.S. on securing a deal for the Syrian government to surrender its chemical weapons last year. CNN Producer Dan Merica contributed to this report. The republicans are clearly terrified of Hillary Clinton. Obama is handling it CORRECTLY, the GOP party of STUPID would have us in a losing WAR by now. We don't OWN the world and send YOUR sons and daughters and the GOP congress FIRST. We KNOW the GOP slugs are all COWARDS with BIG mouths!!!! All this talk about Putin and Georgia, I didn't notice the invasion, but I don't think Putie would be any worse than the idiot Republicans running my state now. Correct me if I'm wrong but didn't Hillary Clinton say is was time to tone down the rhetoric while moments earlier saying Putin was Hitler? Maybe I missed your point. We don't know what goes on behind closed doors, but i don't really think our President is doing nothing. Since the new leaders of the Ukraine are leaning West, we will probably do something, with Europe I hope, to help THEM build a functional democracy that works for their people, and is not totally offensive to Russia. Russia needs to lighten up, but on the other hand, the elected government of Ukraine was OVERTHROWN, and Russia has a right to be concerned for its own interests. I trust our President to take all those issues in hand, plus other issues we are not informed of.